Decware introduced a new style of amplifier chassis this year with the launch of their ten year anniversary amplifier, the TORII MK II. This new platform uses thick aluminum plates sunk into interchangeable hardwood bases. 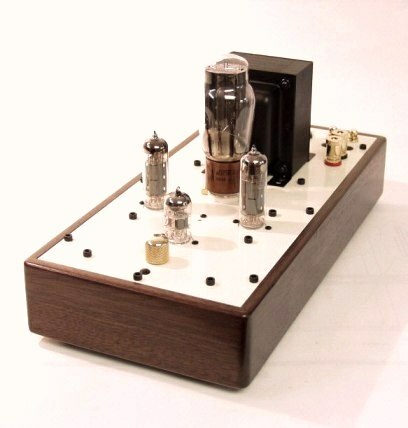 Pictured above, the TORII Mk II amplifier. With the success of this new chassis design, Decware has decided to implement the concept in more of our products. What will change are the products presently built on the 10x6x2 black or brown chassis such as the SE84CS pictured left, the SE84CSP preamp,the TABOO and possibly the Zen Triode Phono stages. By stretching the chassis out to 14 inches we develop a sleeker looking product with not only several layout improvements but also with better sonic's from the significantly higher mass chassis. Of course the finely honed circuits in these products will remain unchanged or even improved, ensuring the same head-shaking fidelity is likely to continue. Pictured above without any parts is an example of the top plate of the new chassis. Below is one of the resulting production products, our new CSP2 preamp/headphone amp.